Prince is horrified to find this cheeky cod trespassing in his kingdom. "Halt, peasant!" Pirate is sure this scurvy sea slug has come to plunder his treasure. "Avast, ye scurvy sea slug!" And so begins a battle of regal sneers, seaworthy stink-eyes, and off-the-hook insults. 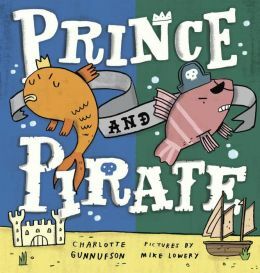 Prince and Pirate's hilarious duel for territory will elicit gales of giggles, hearty guffaws, and heartfelt smiles. Just when it seems their struggle might end in a silly stalemate, a little surprise convinces them to find a way to get along--swimmingly.